This time of year lends itself to self-reflection, resolutions and is a good time to take stock of what is important in our lives and the lives of our loved ones. At Care Dimensions, we believe that one of the most important resolutions you can make in 2019 is to engage in advance care planning by completing an advance directive. Advance care planning involves taking steps to ensure that you get the medical care you would want if you were unable to express your wishes for care. 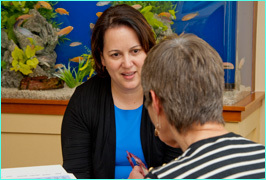 One component of advance care planning is the advance directive. There are three categories of advance directives: the health care proxy, a durable power of attorney and a living will. Each state has its own version of the legally accepted advance directive. In Massachusetts, the only recognized advance directive is the health care proxy that names a health care agent who will speak for you if you are unable. It is a simple legal form that doesn’t require a lawyer or any legal representation. In fact, all you need to make it binding is two adults to witness your signature. As important as it is to complete an advance directive, it is equally important to have a conversation with who you chose as your health care agent and other important individuals in your life so that they know what your wishes would be if you were unable to speak for yourself. As a hospice and palliative care physician, I know that these decisions are not easy to contemplate. Most people think that they will have plenty of time to take care of this but as Ellen Goodman of The Conversation Project states “it is always too soon before it’s too late.” Everyone 18 years of age and over should have an advance directive and consider voicing and documenting their health care wishes. Advance directives are simple, easy to enact documents. It’s important to note, that advance directives are only for those situations where someone can’t speak for him - or herself. For example, if you were under anesthesia for surgery, the advance directive would be used for any decisions that needed to be made. But once you’re conscious again you would speak for yourself. While there is no requirement that you must have one, a health care proxy gives you control over choosing who you would want making decisions on your behalf should you be unable to do so. Research shows that people have strong feelings about how they’d like to be cared for at end of life, yet many people never have these conversations with their loved ones. More importantly, a health care proxy isn’t limited to terminal illness – it is for any situation where you can’t speak for yourself, from an allergic reaction to a car accident. Who Can Serve as a Health Care Agent? While many people assume that their spouse or children would be the natural decision-makers for them should they be unable to speak for themselves, the reality doesn’t always work that way. When you can’t speak for yourself, the right to make decisions about your care is open to conflict. One or more family members may disagree. The conflict regarding your wishes and who has the right to speak for you increases the stress surrounding the crisis, and may actually overshadow or delay your treatment while everyone involved tries to sort out who has the right to direct your care. Choosing a health care agent and completing a health care proxy prior to a crisis can help alleviate stress and uncertainty for all involved. Appointing a health care agent through a health care proxy is an important first step in making sure your wishes will be followed. The next step is talking about and documenting what types of treatments you would or would not like to receive, such as whether you would want to use a breathing machine, have tube feedings or be resuscitated if your heart stops. Documenting your choices will make it easier for your health care agent to guarantee your wishes are carried out. You can find several tools at CareDimensions.org to help you have the conversation with loved ones and document your wishes. In addition, the following websites offer downloadable resources and documents: Honoring Choices Massachusetts; Five Wishes; or The Conversation Project.